Congratulations to G.O. 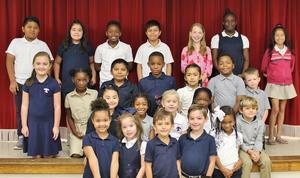 Bailey’s October Students of the Month. These students were chosen by their teacher for having outstanding behavior and great character. They are role models both in and out of the classroom. On Wednesday, Oct. 17th they enjoyed a delicious breakfast with their families. They will also be treated to a pizza party later in the month. Please help us give a shout out to these amazing students.